Developers are seen as a cynical lot. But not all developers are the same. Melbourne-based residential developer, Neometro, for example, is certified as a B-Corporation, which means it has passed stringent tests regarding its social and environmental performance, and its accountability and transparency. It’s the only developer in Australia with that certification, says marketing manager, Laura Phillips. This might explain why Neometro’s content marketing play, Open Journal, stands out from the crowd. It’s not about selling; it’s about building a community, serving loyal customers, and fostering the values that Neometro thinks are important. James Tutton, one of Neometro’s founding directors, is Open Journal’s publisher, giving the project support from the top. Tutton is also a director of Smiling Mind, a not-for-profit mindfulness app for young people. He believes businesses should deliver both financial and non-financial outcomes. “This is reflected in our approach to design, place making and integrated social and community enterprises,” he says. Neometro’s values are on display in Open Journal. Minimalist and content-focused, with six sections, the stories are mostly about design, but incorporate some elements of social enterprise and planning critique. “We will profile someone who is doing something entrepreneurial in the design sense, or review a design book or a new project,” says Phillips, who joined the company as the journal’s editor in April this year. Neometro’s commercial offerings are covered from a content perspective: an interview with the architects or one of the company’s directors about a new project, or reproducing articles that appear in the press. Events and partnerships provide content. Recently, Neometro and furniture company, the Hub, held a free event about how to furnish an apartment. The lessons became a story in the journal. Neometro’s B-Corp certification takes the pressure off the company’s content marketing program. It doesn’t have to pay its way; it contributes to Neometro’s social performance. It also runs on a shoestring. Phillips manages the site singlehandedly in two days or fewer, with a small budget to pay student contributors. The rest of her week is spent marketing property projects. 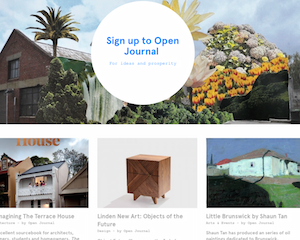 Open Journal is an online publication, with a weekly newsletter or EDM (electronic direct mail), but it has been printed on one occasion. Why print? “It is a good way to raise brand awareness within a new precinct,” says Phillips. The company plans to print another issue to coincide with a new project opening in the inner-city suburb of Brunswick. Phillips publishes three new stories in each EDM, and shares them through Facebook, Instagram, Twitter and LinkedIn. Interested subscribers sign up from the website, while everyone who calls Neometro gets added to the database. There are about 8000 subscribers. Subscribers are keen for more events, a subscriber survey earlier this year revealed. Neometro partnered with magazine Dumbo Feather on the first in the series – Keeping Melbourne Liveable: Urban Social Initiatives – held at the MPavilion. The next event – Urban Wellness – posits the idea that living close together can be good for our mental wellbeing. And in January next year, the third is about Reinstating the Neighbourhood, or “urban placemaking” in architects’ parlance. It’s all about building community. Neometro wants Open Journal to create a sense of community beyond initial purchase. That keeps clients loyal – referrals and repeat custom are a big part of Neometro’s business model. “Every building we build is a part of our portfolio, and every resident and tenant will be an ongoing referral,” Phillips says. It’s tempting with a successful content marketing program like Open Journal to commercialise it – bring in the advertisers, and make it pay its own way.